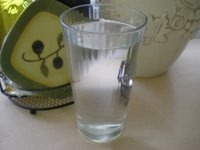 A filtered water system is inexpensive healthy water right from the tap. Drink water from a glass. Plastic water bottles are associated with being improperly disposed of, and plastic bottles may contain toxic chemicals. Tap water may be the least expensive, but may be unsafe with concerns of chlorine, contaminants and bacteria. Water makes up over 70% of the body, and is an essential nutrient for regulating digestion and eliminating toxins. Cold drinks lower the temperature in the stomach below what is needed for efficient digestion and should be avoided. Water is the easiest way to maintain good health and to prevent disease and sickness. It is essential to drink eight, 8 oz. glasses of water a day.